Google’s mobile algorithm update is coming on April 21st and if you have a non-mobile-friendly site, you may have a fair amount of anxiety. Depending who you talk to it’s either the end of the world as we know it, or this is just another bump in the road and we’ll get through it. The fact of the matter is that the true impact of the update is going to be different site by site. No algorithm update affects traffic equally across all websites. So how can you really know how this mobile algorithm has impacted your site? Here are two reports you can use to do just that. Google has been making some changes relatively under the radar with its Webmaster Tools application. 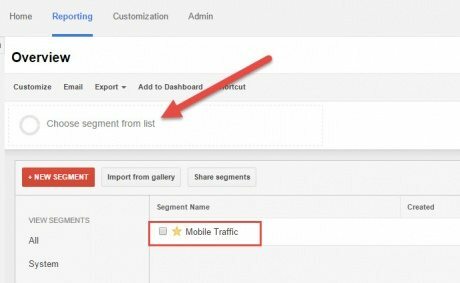 One that has rolled out recently is the ability to segment the Search Queries report by search type (Image, Video, Mobile and Web) as well as by geographic location. The Search Queries report shows you how many impressions (each time your site shows up in a search result is an impression) your site is getting for specific keywords, giving you an understanding of your site’s visibility within Google. 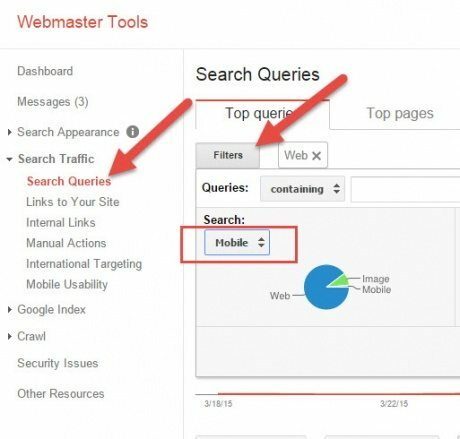 The Search Queries report is located in the Search Traffic left navigation menu within Webmaster Tools. From there you can choose to filter the data and the option we are looking for, mobile, is in the dropdown menu under “Search:”. Google Webmaster Tools data is not 100% accurate. The click data does not match up to traffic numbers in Google Analytics and they only display a portion of the data they report. Only the last 60 days of data are stored in Webmaster Tools. If you wait too long after the algorithm update, you will not have previous data to compare for changes. Now that we’ve got that out of the way, let’s talk about how to use this report. I would recommend waiting a couple of weeks or a month after April 21st, then set the reported date range to start a month before the update and end on the date in which you are checking the report. This will give you a look at your site’s visibility before and after the algorithm update and should be a major indicator as to the impact of the update. The true affect of the algorithm will be reported within Google Analytics. One of the advanced segments available is for Mobile Traffic. Please note that on its own, this segment is for all mobile traffic (direct, e-mail, paid search, organic). In order to see how the algorithm has impacted your site, you need to access the Acquisition -> All Traffic -> Channels Report. The channels report will break out the various sources of mobile traffic. 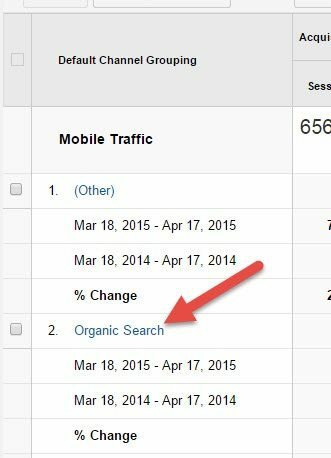 To view the impact of this update, we want to look just at Organic Search and can do this by clicking through in the data table of the report. As with the Webmaster Tools report, set the date range to a month before the update up to the current date. Since Analytics stores data for all time, you can also compare this to the previous year. This will allow you to not only look at the mobile traffic trend from week to week and month to month, but also look at how that trend has affected year over year change. For example, if the month prior to the update, your mobile traffic was up 40% year over year compared to an increase of only 10% for the month after, you will be able to accurately assess the impact. In summary, we can all make predictions for how large or small of an impact this update will have, but until it happens, the truth is no one knows. You have now been armed with two tools that will help you assess and prepare for your site’s future.